Photo right: Debbie Bryant scooped soup from a large pot that was purchased with a grant from the Mississippi Conference Connectional Ministries. Photo below right: Members of the Beacon Harbor Residential Home for mildly handicapped adults were fed one Christmas Day by St. John's UMC. A few years ago, the Mississippi Annual Conference assisted with the purchase of large aluminum pots, a commercial sized can opener, an electric slicer, and two steamer roasters. These items were desperately needed according to Debbie Oxman. She made the request on behalf of her church to the conference for a mission grant to buy them. Oxman is a member of St. John's United Methodist Church in Greenwood, Mississippi. For more than a decade, the church has been delivering meals on Christmas Day to those who sign-up to receive one. The program is also one of the few serving food in the community on Christmas Day. More than a dozen volunteer drivers deliver the meals. The demand for feeding is year-round due to extreme poverty. 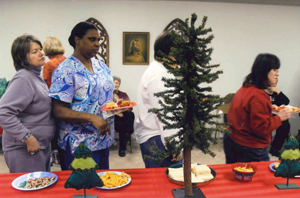 In recent years, the generosity from Mississippi United Methodists has afforded the church opportunities to extend their love beyond Christmas Day. "St. John's Methodist Church of Greenwood, Mississippi appreciates being the recipient of one of the Mission Grants. Each Christmas Day; we serve and deliver approximately 175 meals to those throughout Leflore County. We also treat the firemen on duty and the convenience store workers in our small town. Thank you all for supporting conference missions so that churches like us can serve those less fortunate," said Oxman.